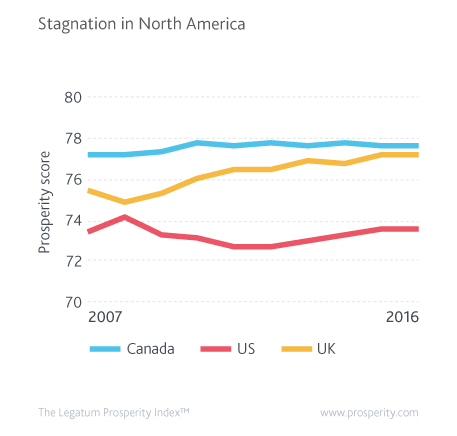 Compared to other top 20 countries, North American prosperity has seen marked stagnation over the past decade. Canadian prosperity has risen marginally, while US prosperity is no different in 2016 than it was in 2007. Compared to progress in countries like the United Kingdom, North American prosperity is stagnating. To reverse the trend of stagnation, North America must progress in areas where prosperity is weak. In both Canada and the US, declining performance in Health and Safety & Security is undermining gains made elsewhere. Canada has slipped two ranks in each sub-index since 2007, and the US has fallen ten ranks to 52nd in Safety & Security and 11 ranks to 32nd in Health. Economic growth rates in the US have improved and unemployment is now lower than in Canada and most of Western Europe. However, stagnating prosperity and a declining prosperity surplus are fuelling discontent among Americans. Satisfaction with living standards and household incomes is falling. While the US’s comparatively strong recovery from the global financial crisis is a matter of record, it has not seen improvement in the lives of Americans. While it is true that household income in real terms is now below 1990s levels, the real cause of stagnation is social. 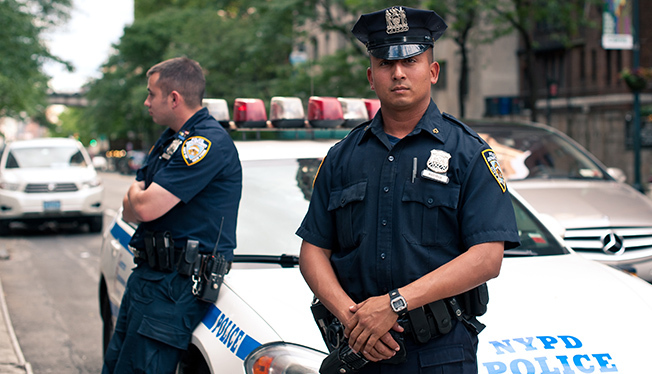 Safety & Security is in serious decline, driven by violence and terrorism. Serious issues exist in healthcare, where satisfaction with the current system has fallen and key problems such as obesity and mental health are on the rise. Personal Freedom has been hit by falling levels of tolerance. Together, these social issues are a significant obstacle to an increase in American prosperity. 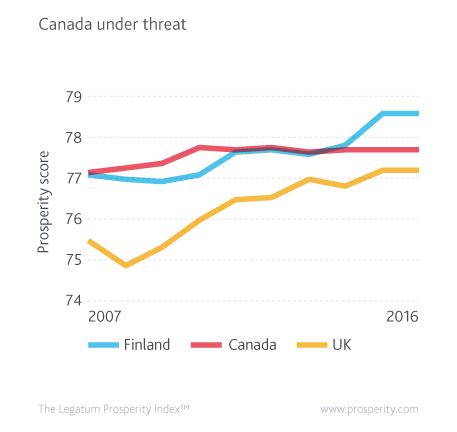 While Canadian prosperity has been broadly static over the past decade, the composition of that prosperity is on the move. Canada and its fellow developed Commonwealth nations – New Zealand, the UK, and Australia – form a bloc that is better than any other comparable grouping at delivering prosperity to their citizens. The pattern of this delivery is very clear. Canada’s prosperity has been growing broadly along the lines seen in other comparable nations. Greater labour market flexibility has improved the country’s Business Environment ranking to third. Governance has been improving, and Personal Freedom and Social Capital remain among the three best in the world. Free markets, free people, and strong society are increasingly the cause of Canada’s prosperity success. However, a note of caution is required. Despite stagnating wealth, the UK has maintained strong prosperity growth by means of social reform. So too has Finland. With Canada slipping in both Health and Education, the nation’s consistent top six finish is threatened. If Canadian prosperity remains static, large gains by countries currently ranked below Canada threaten to propel them upwards and beyond. Finland has already overtaken, and the UK is rapidly catching up.